The legend of Saint Francis, as recorded by Thomas of Celano and Bonaventura, is the subject of a cycle of 28 frescoes in the Upper Church of the Basilica di San Francesco in Assisi. They were painted between 1297-1300, at the same time as Giotto's Florentine master, Cimabue painted the walls of the transept. 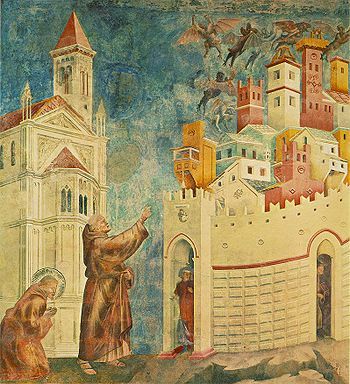 The authorship of "The Legend of St. Francis", traditionally attributed to Giotto di Bondone, has been disputed by many art historians since 1912. The written records for the monastery's accounts during this period were destroyed around 1800. Tradition has given to Giotto, the best-known naturalistic painter of his period, the authorship of these works, or at the least, the credit for having designed them. There was, at the time of their creation, an active school of fresco-painters in Rome, whose style, judging by the scant remains, was very much more realistic than the Byzantine imagery of Tuscany, epitomized in the works of Cimabue and Duccio. The best known of the Roman school was Pietro Cavallini, an established master. However, very few frescoes of any sort from this period exist in Rome for comparison, and only a single Roman Church dates from this period. Many older churches were lavishly redecorated in following centuries and frescoes were destroyed. 2. St Francis Giving his Mantle to a Poor Man. 3. Dream of the Palace. 4. Miracle of the Crucifix. 5. Renunciation of Worldly Goods". 6. Dream of Innocent III. 7. Confirmation of the Rule. 8. Vision of the Flaming Chariot. 9. Vision of the Thrones. 10. Exorcism of the Demons at Arezzo. 11. St Francis before the Sultan (Trial by Fire). 12. Ecstasy of St Francis. 13. Institution of the Crib at Greccio. 14. Miracle of the Spring. 15. Sermon to the Birds. 16. Death of the Knight of Celano. 17. St Francis Preaching before Honorius III. 19. Stigmatization of St Francis. 20. Death and Ascension of St Francis. 21. Apparition to Fra Agostino and to Bishop Guido of Arezzo. 22. Verification of the Stigmata. 23. St Francis Mourned by St Clare. 24. Canonization of St Francis.jpg. 25. Dream of Pope Gregory IX. 26. The curing of a man from Ilerda. 27. The confession of a woman from Benevento. 28. The relief of the heretic Pietro. This page was last edited on 4 January 2018, at 00:05.